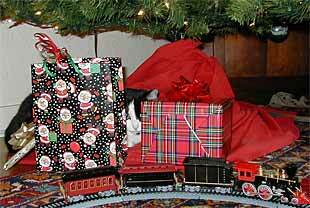 If you have cats, then you know there is a mystical bond between your furry felines and your model trains. 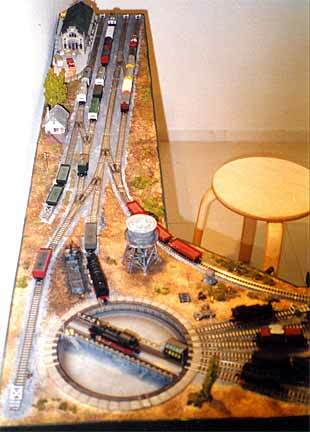 I was reminded of this the other day when a friend of mine (not a model railroader) sent me a photo of an HO train set and circle of EZ-track that she bought last Christmas for the sole purpose of entertaining her black and white cat, Beardsley. Here’s the photo … my friend’s description of what’s going on here is: “She watches, and she watches, and she watches, and she watches, and she pounces. The train is derailed every time!” You can see the Mighty Hunter here, scouting her prey from behind a screen of gaily-wrapped packages. Well, this scene ignited a thought in my mind. Why not design a small layout for the sole purpose of royally entertaining the family feline(s)? It should have a train that changes speed frequently, pops into and out of tunnels, twists and turns around the tracks, and has lots of view interrupters to make the whole process of derailing the consist a continuing cat challenge! 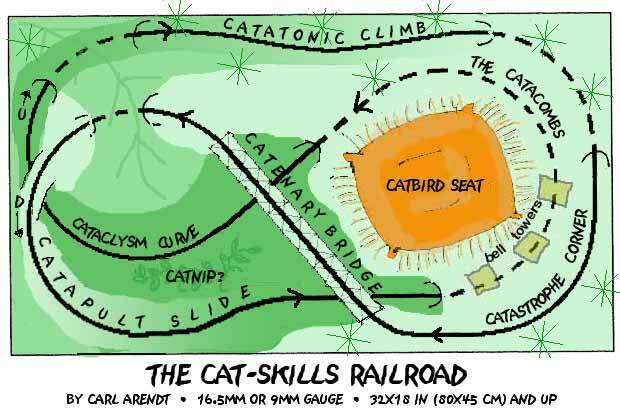 So here’s the design, The Cat-Skills Railroad. It’s presented here in October so there’s plenty of time for you to build one before the holiday season. This unrepentent spaghetti-bowl of track provides a thrill a minute for a train-hungry cat. Let’s take a quick journey around the line, beginning in The Catacombs, an underground chamber beneath the Catbird Seat, presumably the main haunt of the layout’s master or mistress. (The Catbird Seat is the highest point on the layout, befitting the dignity of the presiding feline. I’ve drawn a fluffy pillow, catering to comfort, but probably blanketing or a carpet scrap would work well.) If you prefer, this high and level area could be used alternatively as the location for a small Christmas tree. Your train can be almost any scale you like — either 16.5mm or 9mm gauge can be used, so scales from Gn15 down to N will work just fine. The main requirement of all rolling stock is sturdiness — these trains will need to be highly shock resistant! The train leaves The Catacombs running counter-clockwise, and immediately passes through Cataclysm Curve … a highly vulnerable zero-level location that is easily accessible from either the Seat above or from three of the four sides. It might be worthwhile to provide some living catnip plants here, to draw attention away from the train and give it a running chance! Ducking under a bridge and through a tunnel, the train enters the long grade to the upper level, Catatonic Climb. The idea here is to set the throttle at a single speed setting for the whole layout; then as each car hits the grade, the train speed will slow down a little more (we’re assuming heavy, armored cars). The change in velocity as the train climbs the long, slow grade will definitely attract your cat’s attention, and probably be the scene of some picturesque blitzes. At the top, our train disappears from view, ducking into a tunnel to reappear headed in a different direction. This may be momentarily distracting for puss … but attention will quickly be refocused as the train begins to pick up speed and round Catastrophe Corner. Rather than provide an easy target, I’ve suggested giving the consist a sporting chance by lining the rails with intermittent trees and perhaps with some sturdy bell towers that jingle distractingly when struck with an errant paw. And so, if we’re lucky, we proceed across Catenary Bridge. This should definitely be the sturdiest structure on the layout … but a well-timed poke between the girders can still wreak havoc with the boxcars! And then, after ducking through another distracting tunnel and around a sharp curve, we whoosh into Catapult Slide — an extremely steep and fast downhill run, or schuss. This will undoubtedly be the star location on the layout for iron horse carnage. And so it’s into The Catacombs again, out of sight and breathing heavily, and time for another round. If built with a 6-inch (15 cm) minimum radius, this railroad will be a true micro layout measuring 32×18 inches (80×45 cm); if you use an 8″ radius, the dimensions will be 48×27 inches (120×68 cm), and with a 12″ radius this small layout will occupy 64×36 inches (160×90 cm). Two final technical thoughts. It would probably be wise to place heavy weights on the layout (or find a way to fasten it to the floor). And second, operation will be greatly improved if you scatter a large number of rerailers around the circuit. And there you have it — hours of entertainment for the whole family, including the cat(s)! Mark Kendrick, who lives in Sydney, Australia, designed this corner layout to provide a shunting challenge and some excellent scenery opportunities. Originally designed for On30 (O16.5), the layout is now under construction in On2 (O14), using 14mm gauge and the British O scale of 7mm to the foot. The design is divided into two halves, an Old Town (top) with a typical waterfront warehouse look, and a New Town representing a more recent industrial development. 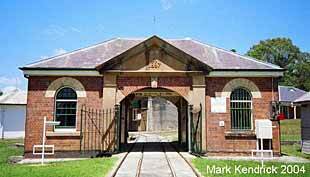 The two sections are connected by an impressive Gatehouse, modeled after a real structure in Newington NSW (photo above). An offstage fiddle yard at the upper right serves as a continuing source of traffic for the switch engines to distribute among the many industrial sidings on the layout. An extra shunter will be needed in the lower New Town in order to handle the kickback sidings. It lives in a small enginehouse just inside the Gatehouse. Many additional details are in Mark’s mind and being added to the layout, including working second-floor hoists in the warehouses against the top wall in the Old Town, and a series of wagon turntables at the awninged lab building in the New Town (lower left) — modeled after another real structure in New South Wales. For more details about the plan, including Mark’s original thinking and some revisions he’s making as a result of Internet correspondence, take a good look at his website. After we published last month a plan for Sayerville, a classic corner layout, Ignacio O’Callaghan from Barcelona, Spain, sent in this photo of an N scale version of the same layout. He built it about 10 years ago, and used the simpler track arrangement that Ray Klatt, the designer, also preferred. The other leg of the corner was a concealed fiddle yard, off to the right and out of the picture. The “main line”, curving at the inside of the corner, quietly vanished and exited to the “rest of the world”. Ignacio has a talent for adapting American layouts to European prototypes. There’s more of his work at the bottom of this page. 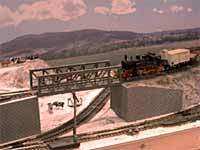 Fabrice Fayolle’s American narrow-gauge layout, Josephtown Craddonium Co., has been featured several times in these pages – notably in April and May 2004. Now the first module of this project has been completed – the locomotive depot. 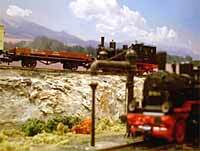 Here is a photo of the completed layout, showing the impressive scenery as well as some of the fascinating rolling stock including a shay locomotive. 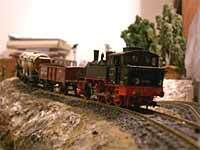 Fabrice has prepared a web page of information about the layout in both French and English. He lives in Amiens, France. SWITCHBACKS IN SPAIN — WITH GERMAN TRAINS ON A U.S. LAYOUT! Here is a truly international model railway project — it’s being built by a Spaniard, Ignacio O’Callaghan who lives in Barcelona; it features German track and train models; the plan is a version of Chuck Yungkurth’s popular U.S. design, the Gum Stump & Snowshoe; and the backdrop is a series of photographs that Ignacio took in the Pyrenees Mountains, near the French border. Here’s an overview of the whole layout. Grades are about 9% and create no obstacles to operation. Ignacio uses a waybill and card system of operation (you can see a few of the waybills in the above photo). 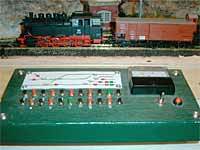 In addition, Inglenook switching games are played using the three sidings at the right front, next to the homemade control panel. The layout is not yet officially named, but he names all his layouts after labels on the commercial structure kits he uses. 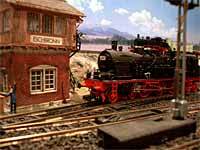 In this case, the signal tower is called “Eschbronn”, so the layout will probably be called Upper and Lower Eschbronn. The cat layout made me laugh and laugh!